Ruthless Brentford gave Sky Bet Championship new boys Rotherham a baptism of fire with a passing masterclass and ruthless win at Griffin Park. A Neal Maupay brace and goals from Sergi Canos, Ollie Watkins and Lewis Macleod did the damage in a 5-1 home success, with Will Vaulks grabbing a late consolation for the shell-shocked visitors. Brentford took just four minutes to open their account for the season, Maupay slotting home from close range. Yoann Barbet's left wing cross found Canos, whose first time effort was parried by goalkeeper Marek Rodak into the path of the predatory Frenchman. The Bees made it two just before the break when Lewis Macleod's corner was half cleared into the path of Canos, who hammered it inside the post from 15 yards. Watkins made it three minutes after the restart with the goal of the game, stepping over the ball as he burst in from the left before firing an unstoppable rising drive between the angle of the near post and bar. Maupay bagged his second on the hour mark, pouncing on a parried Macleod drive to tap home from close range, before Macleod made it five with a sizzling low drive from the edge of the box with a minute to go. Brentford keeper Dan Bentley was furious at seeing his clean sheet ruined by the Millers' injury time consolation, when Vaulks fired home from 20 yards as the Bees defence failed to close down. The Millers had Rodak to thank for keeping them in it in the 13th minute when he got a touch to Romaine Sawyers' 20-yard piledriver, touching it onto the bar. Dean Smith's rampant side thought they had earned a penalty in the sweltering heat when Barbet's left wing cross was blocked by the hand of Vaulks - but the referee waved away the home side's protests. After a water break Rotherham had a strong spell and might have equalised against the run of play when Michael Smith's angled cross found Joe Newell, who saw his volley palmed to safety by Bentley. Brentford were always a yard faster in thought and execution and the gulf in class between League One and the second tier was cruelly exposed. Richard Wood, with a header past the upright, and Kyle Vassell - whose headed effort was straight at Bentley - were the only ones to seriously trouble the Brentford rearguard. Canos might have added to the tally on 62 minutes at the end of a 15-man move that summed up the clash - but his impudent chip was blocked by Rodak. The win, Brentford's best opening day success at this level, took them to the top of the opening day table. 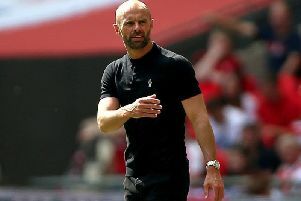 Rotherham boss Paul Warne admitted: "This was a cold splash of water in our face. "We played against a very good footballing side which was not an ideal first fixture back in the Championship. They fully deserved the win and were by far the better team in every dimension. "This is the standard. When you're promoted you have a honeymoon spell over the summer and maybe us coming here and being out-performed is the eye opener we needed. "The big positive is that we don't have to come back here again this season. They are a great team who will turn plenty of sides over. They are good players individually and that's why they are rated as high as £15 million." Warne was pleased with his side's attitude, though, saying: "They gave me everything but collectively we weren't good enough to cause them problems. "This is a much better standard than League One. Brentford weren't putting alehouse balls in, their movement was great and it's very difficult to deal with. But even when we were losing we kept trying to score a goal. "We have had a chat in the dressing room and there's no one shouting at each other. We know what we have to do but perhaps this wasn't the best place for us to try to do it."